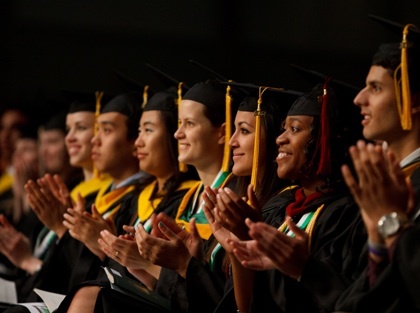 COLLEGEDALE, Tenn. --- Mere weeks after the 2015 graduation exercises, Southern Adventist University administration has announced that 100 percent of the school's graduating seniors have found employment. Adventist-owned snack cake favorite Little Debbie (owned by McKee Foods) has hired every single graduating senior, even managing to poach Loma Linda-bound pre-med students to work in the company's Research and Development Division. Although many have expressed surprise that students representing such a broad range of academic disciplines have managed to find work with the snack cake giant, it appears that students representing all majors were heavily recruited by the firm which is headquartered close to the university's campus in Collegedale, Tenn.
"We are determined to nurture strong ties with Adventist church leadership and this means hiring and training a team of theologically-savvy lobbyists that speak the language of church leaders," said Little Debbie spokesperson Geert Wricher, emphasizing the special importance of graduates from Southern's School of Religion. "We need brand ambassadors that are positioned to persuade church leaders to shape appropriate church policy on everything from interpretation of the health message to the acceptance of large donations," said Wricher. "Our church has an impact to make on society. Adventists should be the head and not the tail of America's budget dessert industry." LOL! Good one, sevvy. Full of irony and clever humor–even the name of the “Little Debbie spokesperson Geert Wricher.” Wouldn’t we all like to Get Richer? I’m seeing Little Debbie everywhere. Now it’s time for Little Debbie to expand her product line . . . she has a well-established brand identity . . . in keeping with the spirit of the Adventist Health Message, I think Little Debbie should get into sodas and ice cream. Then forward to fast food . . . a national chain of Little Debbie Burgers featuring veggie Debbie Burgers and veggie Debbie Dogs with Debbie Fries and floats made with Little Debbie Soda and Little Debbie Ice Cream. Can Little Debbie candy be far behind? . . . Jolly Debbies! Maybe the big tithe dollars pouring in from McKee Foods transform this junk food into health food? I also heard that Little Debbie has a Catholic priest on staff to bless each package before it heads out the door, so that the ingredients normally shunned by the Health Message will somehow have a wonderful salutary, invigorating effect on each consumer. Now that she has a Catholic priest on the staff, shouldn’t Little Debbie bring in a rabbi and a mullah, too, so she can also be Kosher and Halal? Why shouldn’t Little Debbie be everywhere for Lent, for Passover, and Ramadan? Spreading The Health Message to all the world! As long as the products are gluten-free, non-gmo, locally produced, I think you might have something there. Yes, Milla, I am pleased to assure you that these wonderful new products are completely gluten-free, non-GMO, and locally produced, so they must be OK. Spread the word and do your part to advance the health message* and help students! My old Alma Mater, I can’t wait to get some PUC Zinfandel and a box of PUC Cigars. How “Sweet” of McKee bakery to provide all these jobs. They will make lots of “dough”!!! It’s the “icing” on the cake! !